Black holes have long been at the center of our questions about the Universe. Now, researchers have discovered a way to better study them using by using an X-ray polarimeter. 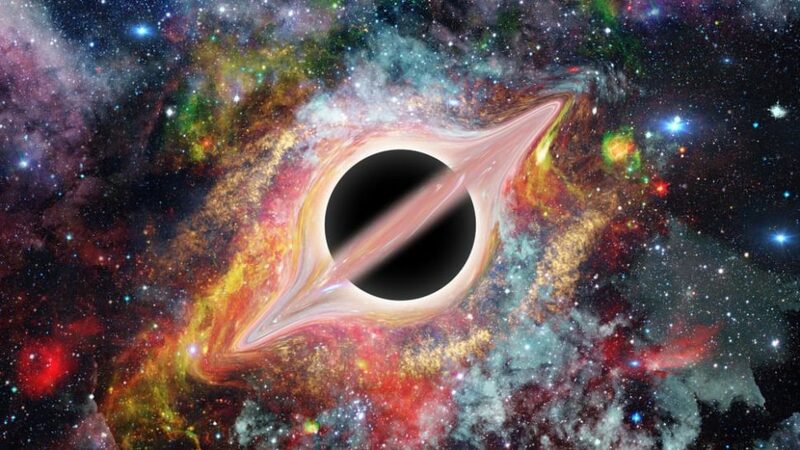 Using an x ray polimeter, researchers may have discovered a new way of unlocking the secrets of black holes. | Image via NASA Images. Astrophysicists have developed a new technique using an X-ray polarimeter that allows them to identify the shape matter takes around a black hole for the first time. Cygnus X-1 holds the honor of being the first ever black hole in astronomy history to be recognized as such by the scientific community in 1972. Located in the bird-shaped constellation Cygnus (or the Swan) over 6,000 light years from us, Cygnus X-1 is a stellar mass black hole binary system that’s one of the brightest X-ray sources visible from Earth. Now, Cygnus X-1 is teaching scientists about black holes’ strong gravity and how it affects the geometry of surrounding matter in binary systems. Many stars come in pairs, or binary systems, either orbiting a neutron star, a white dwarf, or a black hole; such as Cygnus X-1. In these stellar binary systems, especially in the presence of a black hole, a matter transfer usually takes place. The phenomena that ensue are the formation of an accretion disk, extreme elevation of temperatures, and the emission of large jets of X-rays. By looking at X-rays sources in binary systems, astrophysicists can identify black holes within them. An international team of astronomers and physicists have gathered to unlock some of Cygnus X-1, and black holes, secrets, using a new X-ray technique. The team of researchers is from Japan (University of Tokyo, Waseda University, Hiroshima University, Nagoya University) and Sweden (KTH Royal Institute of Technology, Stockholm University). As scientists can’t directly see a black hole, they focus on the matter in its vicinity, which in the case of Cygnus X-1, comes from its companion star, HDE 226868. To get a clearer picture of the accretion disk geometry around Cygnus X-1, the team developed a new X-ray instrument, they call the X-ray polarimeter, which they compare to the way polarized ski goggles filter coming light to improve vision. “It’s the same situation with hard X-rays around a black hole. However, hard X-rays and gamma rays coming from near the black hole penetrate this filter. There are no such ‘goggles’ for these rays, so we need another special kind of treatment to direct and measure this scattering of light,” said Hiroshima University’s astrophysicist Hiromitsu Takahashi, who co-authored the study. To track the light source and figure out how it scatters, the team built an X-ray polarimeter and launched it into the sky using a special balloon called PoGO+. As to how matter would shape around a black hole in a binary system, after analyzing their results, the team seems to favor the extended corona model over the lamp-post model. NASA has also been working for years on the development of X-ray polarimetry technology to investigate light polarization (Imaging X-ray Polarimetry Explorer, IXPE) to observe black holes, neutron stars, and other astronomical bodies. Does this mean artists have to rework their renditions of black hole binary systems?